Listed below is a unique collections of Pinball Stuff for sale. These items are all related to pinball, but are not considered parts. These would look great in a game room, a perfect gift for a Coin-Op Collector, a great Christmas or birthday present, or just a must have for the Pinball Collector. 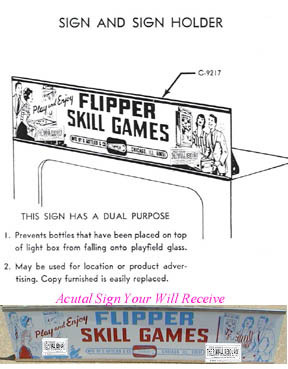 Look at this cool Gottlieb® reproduction sign for on top of your Gottlieb® Pinball machine, shelf, or bar top. It comes complete with its own metal stand, exactly like it looked originally. The sign is 26'' long X 6'' high. The sign is $74.42. A little bit of trivia, did know Gottlieb® sold this sign for a dual purpose, know what is was? Click on the thumbnail picture to reveal the answer.